Erinn Kelley received her BA from the University of Iowa where she majored in English and minored in Women's Studies. She is currently a part-time Environmental Consultant, a full-time mom, an aspiring writer, and a graduate student working toward an MA in English at Indiana University South Bend. 1. Kelcey, did the collection evolve as a series of separate pieces that just happened to speak to similar issues? Or, did you always envision your stories as a collected body of work? KP: Each of my stories begins on its own terms as an individual exploration, and each story reveals a new aspect of my writing. But as these stories accumulated, I began to see connections - in theme, style, and subject - and I began to see the possibility of bringing them together as a collection. That said, not all of the stories I initially sent to Kore are in the final collection, and certainly not all of the stories I've ever written were among the ones considered. 2. Can you tell us if you have a favorite among your stories or if there is a piece in which you feel particularly invested? KP: In "Some Aspects of the Short Story," Julio Cortázar asks, "What is the essential quality of certain unforgettable short stories?" He distinguishes between stories that are 'the best' or most frequently discussed and those that are, simply, unforgettable. His own list includes lesser-known stories by well-known writers. I love this way of thinking about short stories, and it may say something about my answer here. The story that lingers with me is "What Lips My Lips Have Kissed, and Where, and Why," which was inspired by the Edna St. Vincent Millay sonnet of the same name. When I read that poem, I immediately knew it would find its way into one of my stories, and something about the voice of this story's narrator-a high school teacher accused of inappropriate relations with a talented student-seems to fit the lonely tone of the sonnet. The narrator admits to minor offenses such as stealing flowers and library books, but she is unable or unwilling to admit to any wrongdoing with the student. In fact, she wants only to know what others believe: "Do you think I did it?" Cortázar concludes that the "essential quality" of unforgettable stories is that they contain "that fabulous opening from the small to the large." Millay's uncertain poem ("I have forgotten," "I cannot say," "I only know") acts as the portal that allows my story, I hope, to open up to something larger. 3. Your work includes a lot of play with form - space, sentence structure, and the overall appearance of the text on the page. What draws you to play with form in this way, Kelcey? 4. Can you tell us about the writing process? How long does it typically take you to write a single piece and how often do you revise a piece before you consider it finished? KP: Often enough my stories begin - to use a simile - like a metaphor: there's one subject (or image or form), and then there's another. I know I'll make use of each of them individually, but the story begins when I realize they are going to be together, and I begin to seek the connections between them. For example, a friend of mine experienced a late-term miscarriage, and it made me so sad. Another friend participated in a home marketing research survey. I knew I'd try to write about each of them, but I didn't know that one would provide the content and the other the form that would become "Domestic Air Quality," and it was both a delight and fresh challenge to discover it. In terms of time, I do write 'faster' than I used to. But there's two qualifiers to this. One is that even if I write a draft in a week (as I do every spring break), I don't have time to return to it until the summer or fall, so I get the benefit of returning to the story with fresh eyes. The other qualifier is that, after a decade of serious writing, I feel I've achieved what Flannery O'Connor, quoting Jacques Maritain, calls "the habit of the artist." O'Connor says that she wrote "Good Country People" almost without revising, but insists that the story was "under control" throughout the process because she has developed this habit, this "way of looking at the created world and of using the senses so as to make them find as much meaning as possible in things." 5. Your stories are not only beautiful, but also unpredictable and often startling. Can you discuss the inspiration for some of the unexpected ideas that populate the pages of your book - the bride who swallows the fly or the mother who imagines a freeway in her head? KP: Thank you. Maybe it's best if I address the two stories you mentioned directly. "I Heard a Fly Buzz" is a flash fiction that transforms the Emily Dickinson poem, "I heard a fly buzz - when I died," to "I heard a fly buzz - when I got married." It was also inspired by Kate Chopin's "Story of an Hour" (and far too many other stories about women), where marriage and death are uncomfortably interconnected. My story tries to have some fun with the idea that, because of the fly's buzz, the bride says, "I does" instead of "I do." But it ends in the dark and unsettling territory of Chopin's story. In "What Lips My Lips Have Kissed," set in a land of lake-effect snow, the narrator's garden blooms all winter. As I mentioned, the narrator is a high school teacher accused of inappropriate relations with a student, and the reader learns that the student's first poem is about a garden that blooms all winter. Toward the end of the story the narrator jokes that the scientists conducting tests on her garden might find an unfamiliar substance in the soil: "Metaphoracline." Is the winter garden magical? Metaphorical? Or merely imagined? Neither I nor the story will tell. 1. Shannon, what drew you to Kelcey Parker's collection and led you to choose it as one of the first pieces of fiction published by Kore Press? How does it fit with the vision of Kore Press as a press devoted to promoting the voices of women? SC: There were so many factors. But mostly what happened is that I opened the document and I felt immediately in good hands. The authority of the prose was evident; this narrator was in complete control. Yet at the same time the language broke rules, was wild and lyrical and half-sensical. Here are the first sentences I read: My garden blooms all winter. Rose petals bleed on Northern Indiana snow. I mean, really: how could you not keep reading? By the time I got deeper into the manuscript-I think it happened with Kelcey's story Lent, in which a woman gives up her family for Lent, moving into a motel for 40 days and not seeing them at all, even when a crisis occurs-I was in love. I thought, here's an original, unafraid writer. So this is first & foremost what made the stories work for Kore Press: just damn good writing. Yes, we're devoted to promoting the voices of women, but we don't have any particular focus on what those voices are saying. By which I mean we aren't tied to any certain material or subject matter or even literary aesthetic. Just good writing by women and transfolk. 2. How does your own career as a writer of short stories and fiction shape your editorial decisions? Did the fact that you are a writer contribute to your interest in this collection? SC: Oh yes, the writer in me was completely turned on by Kelcey's manuscript. The inventiveness at the sentence level, the attention to language, to the sounds of the words, even to punctuation-this hardly went unnoticed by my writer's eye. In many ways Kelcey is a writer's writer. This isn't to say that she ever allows the language to dominate the story; she doesn't let the form, the voice or the conceit get in the way of narrative, or character. She's a craftswoman for sure, but she doesn't let the scaffolding show-she makes it look easy, which it most assuredly is not. 3. What is it that you most love about Kelcey Parker's work, Shannon? SC: Her misbehaving characters. I just love stories in which the protagonist acts out in unhealthy ways or makes lousy choices for the right reasons. I love stories in which we cannot help but feel intense empathy for a character even as she's doing something ridiculous, or dangerous. The first time I read these stories, the phrase "twisted domesticity" popped into my head, because Kelcey takes the familiar realm of family life and contorts it. She allows an irritant into the mix, and then lets that irritant fester, and of course the character does nothing to calm or solve the irritant (because that would be reasonable, and reasonable characters are usually boring characters). Tossed into this delicious mess is Kelcey's feminist ethic, which is never, ever imposed, never didactic-it's organic, infused. 1. Can you describe the process of selecting stories for inclusion in this collection? How were the decisions to include or omit certain pieces reached? What about the organization of the stories within the collection? How did you determine the way the stories would be presented and the order in which they would appear? KP: This may have been my favorite part of all: having Shannon's input on what should stay and what should go, and on where a story should go once we decided it stayed. Between the time I first sent the manuscript to the time it was going to production, I wrote new stories and revisited older stories that I thought might fit. I sent all of them to Shannon, and she told me in no uncertain terms that we needed to go 'lean and mean' and gave me a list of six stories to cut. That felt great - like an overdue hair cut. I fought back for just one story, and Shannon graciously and immediately agreed. Then followed my favorite part: an intense Skype session with Shannon in Arizona and me in Indiana. Shannon picked up her laptop and showed me all of my stories spread across her dining room table. She had them mapped out, quantified, and categorized. She told me how many happy vs. unhappy endings I had (unhappy won in a landslide). She divided them according to their various lengths (short/medium/long), conceits (formalist, fabulist, realist), and points of view. She performed, in short, a complete diagnostic study of the collection. Thus, when she recommended the placement of the first and last stories, which were very different from what I was thinking, I trusted her completely. She really set everything in place, and helped me think through my stories' arrangement in a new way. SC: I'm so proud of this book, and the work Kelcey and I did on it together. This is the first first full-length book of fiction I've edited, and I couldn't be happier with it. Because I hadn't done this before, I needed to figure out the thinking behind how story collections were ordered. So yes, I did all that analysis that Kelcey describes, and am grateful for what it taught me about editing. Ultimately I hope what I was doing more than anything was listening to how the stories wanted themselves to be told, and of all the wonderful stories in the initial manuscript, which of them were doing that job in greatest harmony with their neighbors. 2. I know that the book's title was inspired by one of the stories within, but how did you decide on that specific title for the collection? 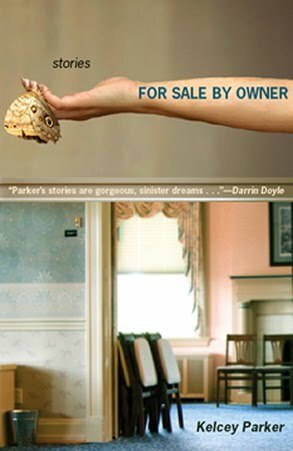 KP: I sent the collection to several publishers with several different titles, but I'd never tried 'For Sale By Owner,' and I have to confess that I didn't really like it when the publisher suggested it. I replied by suggesting a half-dozen overly arty titles and was basically told that the title was going to be 'For Sale By Owner,' that it was the best for marketing and book design. Marketing and design are about the farthest things from my mind when I'm writing, but now that the book is out, I think of these things a LOT. And I know that the title is exactly right, not only for those things, but for the writerly things: motifs, multiple levels of meanings, and even the tone - the sense wanting to give up what one has, and of being on one's own. 3. What advice would you give to aspiring writers? KP: A year ago I started a blog, phdincreativewriting.wordpress.com, where I address this question fairly frequently. As a professor, I work with aspiring writers every single day, and some of those students are doing exactly what it takes to become writers, while other students seem to want to be professional . . . aspirers. The students who are well on their way to becoming writers are those that take as many writing classes as they can, write even if they're not in class, volunteer for the student literary journal, attend local readings, read like words are food and they're starving, participate in open-mics, follow literary debates online, write reviews, and connect with other writers in the community. Becoming a writer is not rocket science, but it's not magic either. SC: First and most important: there are no shortcuts. Kelcey is a perfect example: she's been writing seriously for ten years, and here finally is her first book. My path as a writer is similar: my first book comes out this fall, nearly twelve years since I started writing seriously, doing all the things Kelcey recommends. Typically when editors are asked what we're looking for in a manuscript, we respond with some version of "it's got to grab me from the first sentence." Which is true, absolutely. And also a terribly unhelpful answer for a new writer, who already believes (one would hope) that their work accomplishes that initial grabbing. The part you hear less often is that it takes a whole lot of work and dedication to get the point at which you can write those grabbing sentences, and just as importantly that you understand why they're grabbing; how to know when they aren't, and how to fulfill the promise of that grab in every sentence that follows. As a teacher told me once, getting published isn't hard. Getting published is easy; its the writing that's hard. To read more about (and purchase your own copy of) For Sale By Owner, click here. For more information on Kelcey Parker and Shannon Cain, visit kelceyparker.com and shannoncain.com. I recently bought and read For Sale by Owner and it knocked my socks off. It is witty, erudite, well-crafted. I am raving about it to all my friends. Disclaimer: I do not know Kelcey Parker (but I wish I did). I am not in the habit of leaving comments of this nature (this is like maybe the third time in my life).